Each month as part of this series from the AAS Historical Astronomy Division, an important discovery or memorable event in the history of astronomy will be highlighted. This month's guest author Philip D. Nicholson (Cornell University) focuses on Galileo's discovery of the moons of Jupiter. Interested in writing a short (500 word) column? Instructions along wth previous history columns are available on the HAD webpage. In early January 1610 Galileo Galilei turned his newly-improved telescope to the planet Jupiter and was astonished to find that it was followed in its daily motion by three bright stars, later to be joined by a fourth. He soon realized that these "stars" were in orbit around Jupiter, marking the first discovery of satellites around a planet other than the Earth. Together with his observations of the phases of Venus towards the end of 1610, this was strong support for the Copernican model of the Solar System. The satellites also provided empirical evidence for the universal applicability of Kepler's new laws of planetary motion. 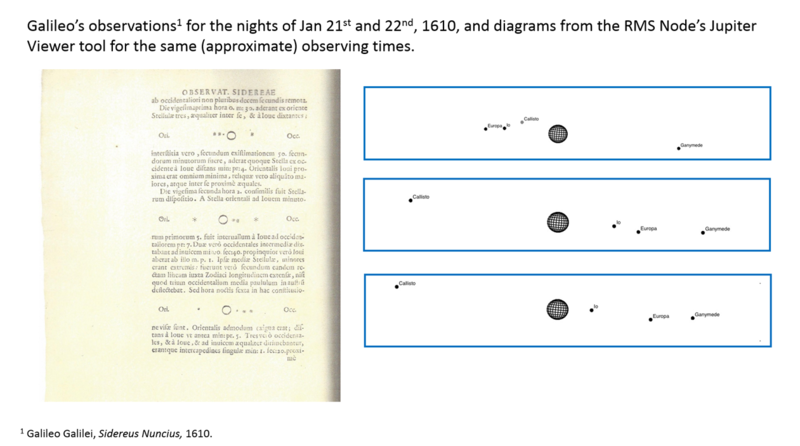 Galileo's initial observations of Jupiter were made on 7 January 1610, at which time he described three bright "stars" close to the planet, aligned in the plane of the ecliptic, with two to the east and one to the west. By 8 January, all three had moved to the west side. On 10 January only two were visible, but again to the east. A fourth companion appeared on 13 and 15 January. Fortunately, the orbital periods of what we now know as the galilean satellites are short — ranging from 1.8 days for Io to 16.7 days for Callisto. Within a few months Galileo was able to sort out their orbital motions around Jupiter, concluding that the inner moons had shorter periods than the outer ones, just like the planets. Kepler himself demonstrated that his third law, first laid out in his book Harmonices Mundi in 1619, could be applied to the satellites of Jupiter in the Epitome Astronomiae Copernicanae, published in 1621 (Russell 1964). In honor of his patron, Duke Cosimo II de Medici, and perhaps in the hope of additional financial support, Galileo proposed naming the newly-found satellites the Medicean stars. His discovery, as well as the proposed names, were prominently displayed on the frontispiece of his book Sidereus Nuncius (or The Starry Messenger), published in March 1610. This idea, however, did not find favor with other astronomers. Following a suggestion by Kepler, relayed by Galileo's contemporary Simon Marius, the names Io, Europa, Ganymede and Callisto were eventually adopted, after several of Jove's amorous conquests in classical mythology. Marius actually claimed to have spotted the moons himself in late 1609 although he had neglected to publish his observations promptly. The new names did not come into official use until the mid-19th century. Prior to this time, they were referred to simply as Jupiter I, II, III, and IV, in order of increasing distance from Jupiter, as they still are in the Astronomical Almanac. In the 18th century, the regular orbital motions of the galilean satellites, and in particular their frequent transits, occultations and eclipses of and by Jupiter, became the most important astronomically-based "clock" used for navigation at sea, prior to the development of the marine chronometer by John Harrison. On his first voyage of exploration to the Pacific, Captain James Cook paid particular attention to observations of the jovian satellites in order to establish accurate longitudes. As a curious footnote to the story, in 1980 Kowal and Drake found that, while following up his observations of the jovian moons in 1613, Galileo made the first known pre-discovery observation of Neptune. He even noted that it seemed to move relative to a nearby fixed star (see This Month in Astronomical History for September 2017). C.T. Kowal and S. Drake (1980) "Galileo’s observations of Neptune." Nature 287, 311-313. J.L. Russell (1964) "Kepler’s Laws of planetary motion: 1609-1666." British J. for the History of Science 2, 1-24. 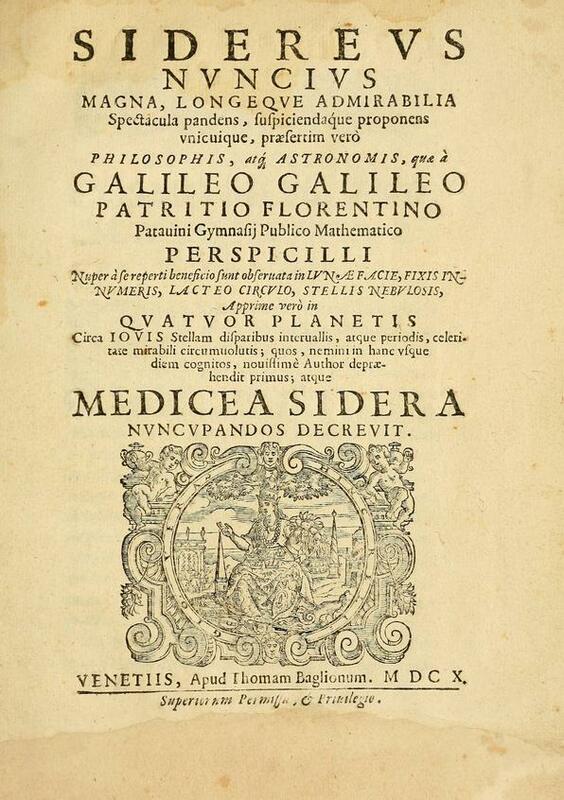 Figure 1 shows the title page of Galileo’s Sidereus Nuncius, published in Venice in 1610, announcing prominently the discovery of Jupiter’s "Medicean Star". (From the volume held in the Bodelian Library at Oxford University).